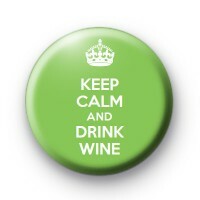 Keep Calm and Drink Wine Badge in a lovely deep green colour with white keep calm and drink wine text. Also, features a crown illustration. Inspired by the keep calm and carry on badges, this has a boozy twist. Perfect if you love to party and enjoy your alcohol. Standard 1 inch badge made in our UK workshop using metal badge components with a copper pin back and plastic coated printed design. We have a whole range of keep calm badges available in our keep calm category. Go take a look.